Since Baselworld is almost finished, we take the time to take you back to some of the – in our eyes – greatest novelties and best timepieces we’ve seen this year. Yesterday our beloved Mr. Baars gave you guys a short story about two icons from Rolex and his vision. 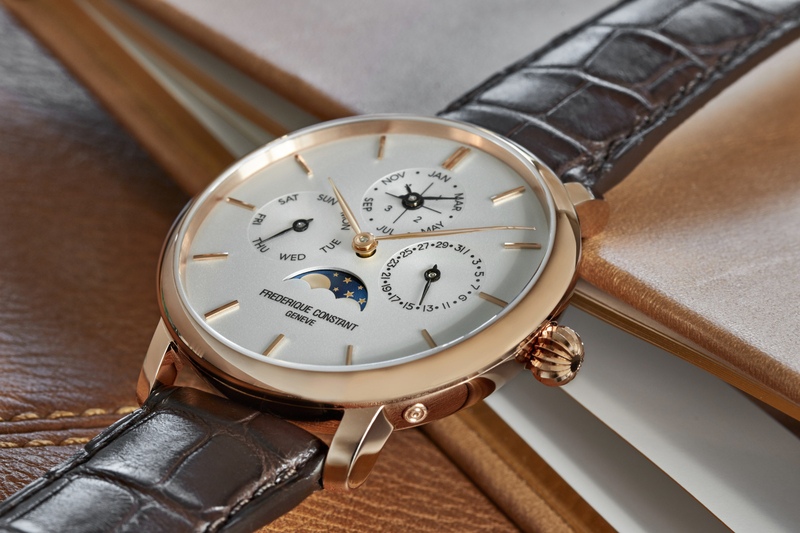 Today, it’s my turn to talk about the new Frederique Constant Manufacture Perpetual Calendar, I can assure you, I’m writing this article with pleasure. 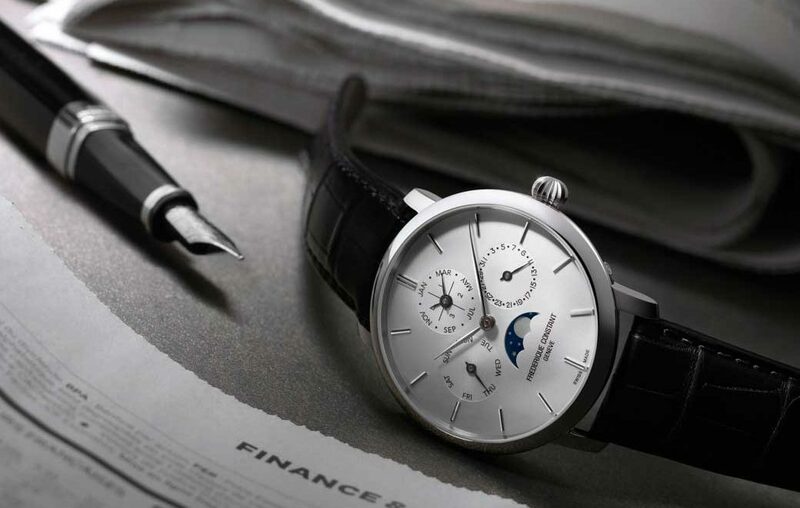 Ever since Frederique Constant launched its own in-house Heart-Beat manufacture calibre, back in 2004, watch enthusiasts all across the globe have paid attention. The beauty of an in-house manufacture calibre is the fact that a brand can truly express their vision and priorities with the creation of a movement. When done the right way, each decision made with creating the movement is in line with the brand history and story. Something Frederique Constant caries out very well If you ask me. 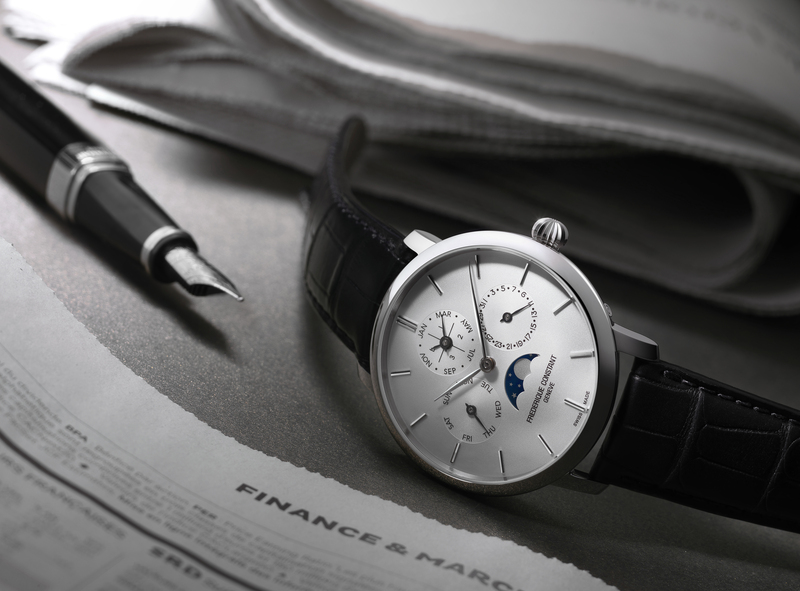 Now, perpetual calendars are well-known by any watch enthusiast, but for Frederique Constant this particular timepiece is an exceptional creation. It’s not merely about the fact they created a perpetual calendar, it’s the fact they created a timepiece with a respected complication in such a way one can easily adjust it and it meets requirements of their customers. I hear you think ‘requirements?’, yes sir, the potential buyer of a Frederique Constant timepiece trusts on: robustness, reliability and easy to adjust. Three priorities that meet in this new creation. Godfathers of the new in-house movement, Manuel Da Silva Matos and Pim Koeslag, have been researching and developing the movement for two years straight. As a result they created one of the most innovative yet easy to assemble perpetual calendar movements ever. A small round of applause is the least thing we can give these two gentlemen isn’t it? The latest technology is used to design the individual parts, and these are all created and calculated with state of the art machinery. Only the best quality passes the test. Of course, next to the gents working on this stunning piece, there has to be a beating heart for this beauty. Meet the new in-house FC-775 automatic calibre. 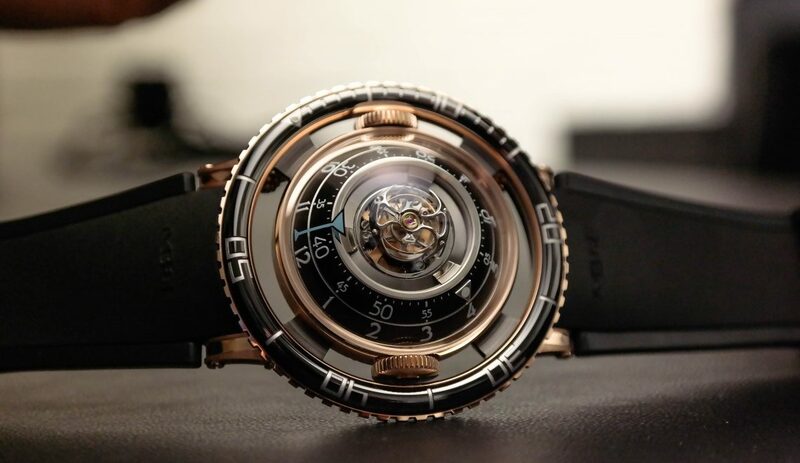 This movement powers the hour and minute hand as well as the perpetual calendar and beats at a frequency of 4 Hz – an estimated 28’8000 vibrations per hour – ladies might like it as well. 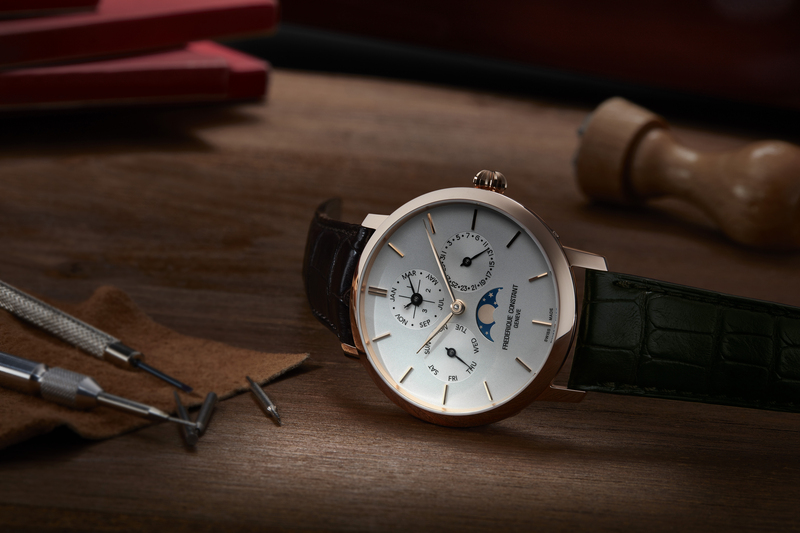 To top it off, the Frederique Constant watchmakers in the Plan-les-Ouates ateliers used and 26 jewels and magically created a 38-hour power reserve. All of this can be found in a thickness of a mere 6,7 millimetres. Since the process is monitored and directed by Frederique Constant from start to finish, they can assure us a perfect harmony when it comes to the 191 parts that can be found in this watch. As I said before they used state of the art CNC machines, resulting in perfectly matching parts with utmost precision. Of course this is a nice sales story, but in my opinion not something to doubt about when it comes to their watches. To help you as a customer to easily set your perpetual calendar, the designers and watchmakers chose for a very good approach. I’m going to give you a quick lesson in ‘How-to-operate-my-Frederique-Constant-Perpetual-Calendar’, you ready? Let’s start with the first of a quartet of small buttons that can be found on the side of the watch. The crown is the biggest and is placed at 3 o’clock, rather normal so we leave it be. 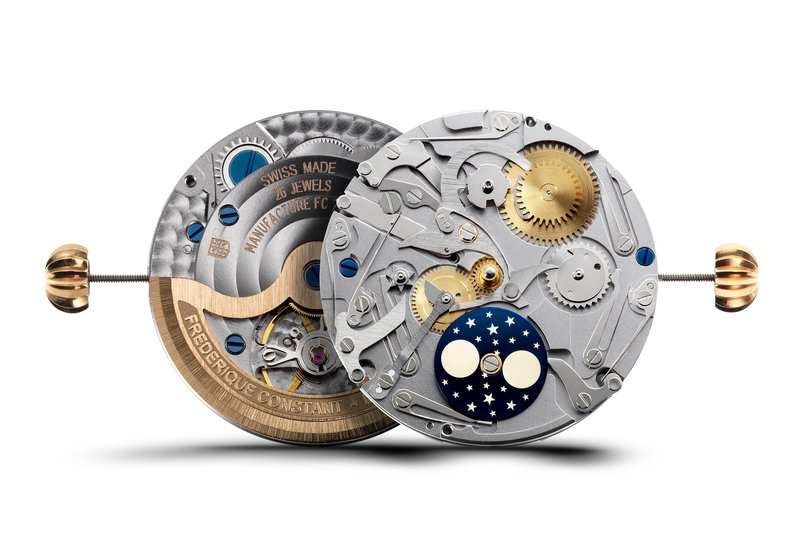 The first button can be found at 5 o’clock and is used to set the moonphase. Not to be underestimated, you can’t show up to a classy party while showing no moon on your perpetual calendar and werewolves are running around crazy. That would be weird, wouldn’t it? Next up: the button at 8 o’clock. This button is used to advance the date of the week. The button at 10 o’clock has the purpose of adjusting the day and date simultaneously. An important note, when setting up your perpetual calendar, you need to adjust the date first and then the day. Last but not least, there’s the button at 11 o’clock, this one is used to show the month and leap year at the same time. I hope this small lesson wasn’t too hard. Of course the minutes and hours are set with the crown. Once this movement is set, it will take in account the months with 30 or 31 days, the 28 days of February and the leap year cycle with the 29th of February returning each four years. A small side note, normally the watch wouldn’t have to be adjusted the next 400 years, but since there’s an exception in the Gregorian calendar, the watch would have to be adjusted on the first of March, 2100. It’s a leap year. Could come in handy when you are chilling in your backyard that day. Write it down. 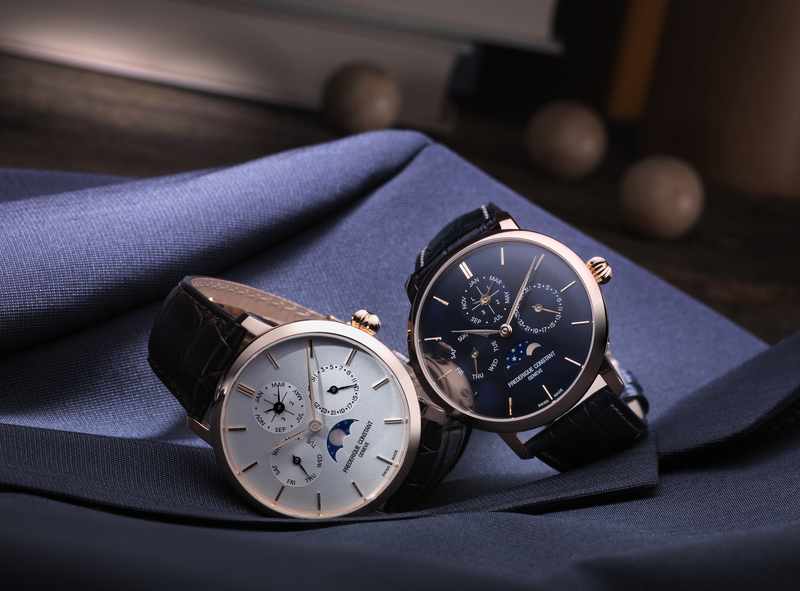 As this Perpetual Calendar is loyal to the signatures of the Slimline Collection, the timepiece will be fitted – as wished for by the customers – with a rose gold plated case or stainless steel. Measuring a neat 42mm in diameter. 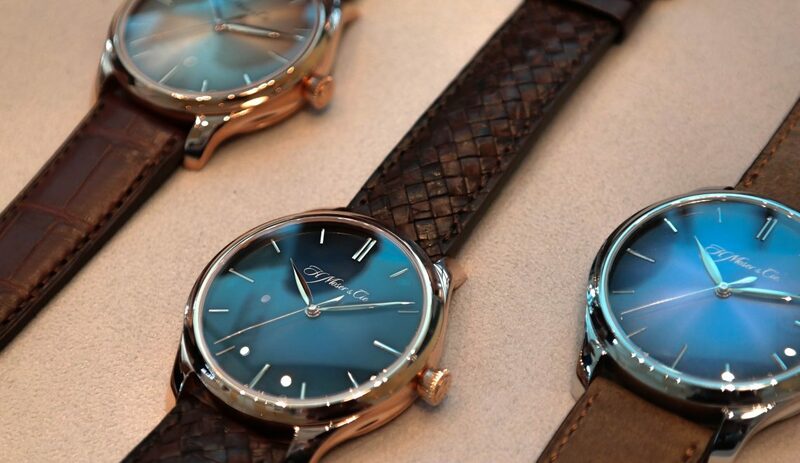 The first three models of this technological candy are presented with a very clear silver or blue dial. 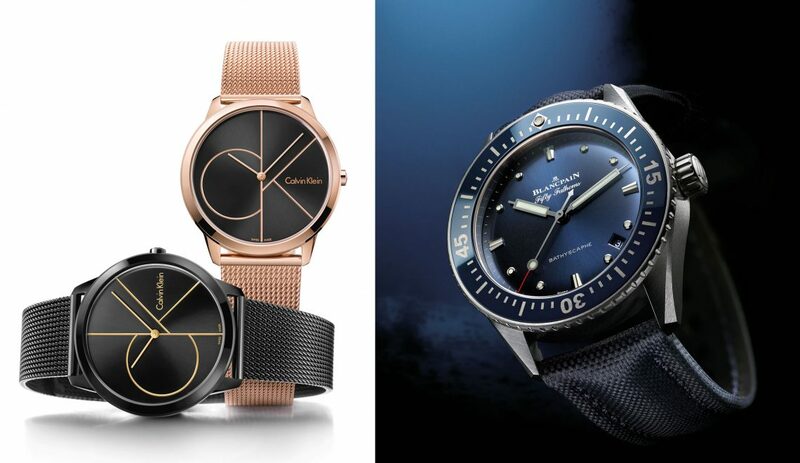 The hour indexes showing the exact same colour as the case of the watch. To finish off this classy piece, all of the models will be fitted with a sapphire case back. Giving its wearer the ability to see the new FC-775 calibre and it’s beautiful Perlage and Circular Côtes de Genève decoration. 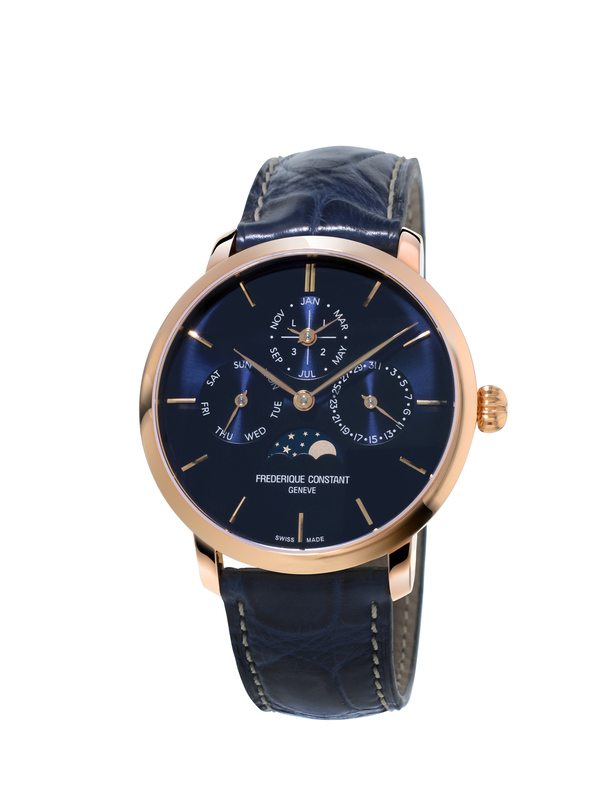 As a result, Frederique Constant created a very tidy and classy timepiece. In my opinion this watch perfectly shows what the brand stands for and gives watch lovers everywhere the ability to buy a good timepiece with great quality in an acceptable price-range. The simple yet elegant design is something you have to like, but it needs a bit of attention to truly see the beauty. Once you’ve accepted al of the details and take a better look at this timepiece, you’ll be full of joy. Believe me.